Take advantage of our joint membership program! ANYONE can join...you just have to love LSU!?? We are not asking a lot of anyone but something from everyone.? Join today and invest in the future of LSU and our future alumni!?? 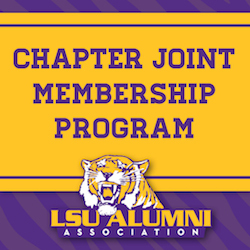 By joining, you will become a member of both Crescent City Tigers and the LSU Alumni National Association. CCT receives a portion of the membership cost. To become a member of our joint membership program click here.